As for the Blue Toon, they remain five points clear at the top of the table, unable to extend their lead on second placed Edinburgh City who they play this Saturday. 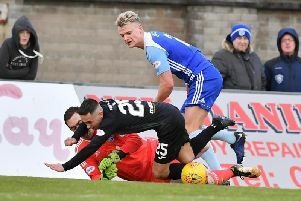 Peterhead arrived at Shielfield on the back of a six-match winning run, but they were undone by first half goals from Lewis Barr and Cameron Blues. There was then a further set-back for Peterhead after 17 minutes when Derek Lyle limped off and he was replaced by former Berwick midfielder Paul Willis. The visitors tried to press, but on 30 minutes Rangers doubled their lead when Cameron Blues netted from close range after a good break from their own half. Calum Adamson crossed into the box and Ogilvie’s flick was saved low down by Greg Fleming, but spun into the path of Blues who netted from eight yards out. 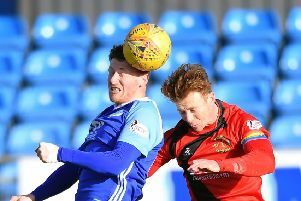 Peterhead, without inspirational striker Rory McAllister, who was unavailable as his wife is expecting a baby, never really threatened in the first half. Substitute Callum Home then saw a half volley tipped onto the crossbar by Brennan at full stretch after 56 minutes. With ten minutes remaining Jack Leitch also limped off for the Blue Toon, whilst keeper Fleming made a good save from Daryl Healy.